In her job at Heal the Bay, a Los Angeles environmental protection organization, former Loyola Marymount University student Leslie Griffin recently helped devise a new system to alert local residents to the quality and safety of the ocean water off the area’s beaches. It’s a job that, Griffin says, allows her to embrace two ideals she learned at LMU: being a skilled scientist while contributing to the betterment of society. Griffin earned a bachelor’s degree in environmental sciences in 2013 and, earlier this year, received her master’s degree in environmental sciences, also from LMU. She began working at Heal the Bay as a data analyst who assesses coastal water quality before she even finished her final classes. Griffin was president of the Belles Service Organization, a resident advisor and earned the highest GPA of the environmental science program in the 2013 graduating class. Helpful professors and LMU’s tradition of community service led to two internships and, ultimately, her job. Griffin was an intern at Heal the Bay’s Santa Monica Pier Aquarium for more than two years. 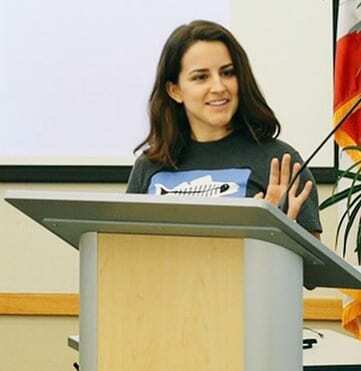 She also did an undergraduate internship at the Santa Monica Bay Restoration Commission. Then, during the final year of her master’s program, she met another Heal the Bay employee while she was helping with an LMU public service program to teach children about the area’s watersheds. He offered Griffin an internship in their education department. The internship led her to her job today as a data analyst.